Many tourists begin their visit to the islands with five days on Oahu. Here are some suggestions on how best to spend those five days. Chances are that if you’re coming from the mainland USA you’ll wake up very early on your first day. It has to do with the time change and your body’s internal clock. So, for this first day we’re going to make use of that early wakeup to explore Oahu’s North Shore. After breakfast, you’ll want to get started by 8:00 to 8:30 a.m. 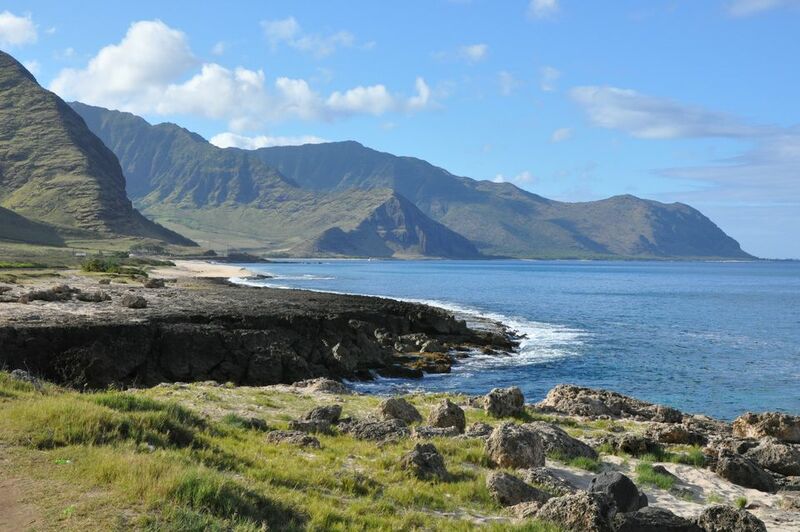 Your drive will take you north through central Oahu on H2 and Highway 99 through the town of Wahiawa and past Schofield Barracks to the world famous North Shore beaches. Your journey along the North Shore will begin at the town of Hale’iwa. You’ll have time to stop in town before continuing northeast along the Kamehameha Highway. If it's winter be sure to stop and see some of the highest surfing waves in the world. Many of you who are surfing fans will recognize the names of the beaches along the way: Waimea Bay, the Banzai Pipeline and Sunset Beach. You’ll then pass Turtle Bay and the world famous Turtle Bay Resort on your left as you round the northern tip of the island. Your biggest stop of the day opens at noon. It’s the Polynesian Cultural Center in the town of La’ie. Here you can experience the multiple cultures of Polynesia as you spend a fun afternoon. If you book ahead, you can stay and enjoy their excellent luau and the after-dinner show Ha: Breath of Life. When you leave the Polynesian Cultural Center it may be late, so hop back on the Kamehameha Highway and head south until you can return to Waikiki or Honolulu via the Pali Highway. You did a lot of driving on your first day, so for your second day, just make the 30-45 minute drive to Pearl Harbor where you can spend as much of the day as you wish. At Pearl Harbor you’ll find the USS Arizona Memorial, the USS Bowfin Submarine and Museum, the Battleship Missouri Memorial and the Pacific Aviation Museum. Be sure to visit the USS Arizona Memorial and at least one of the other sites. If you decide to spend the day, you’ll likely have time to see each of them. If, however, you decide to head back to Honolulu or Waikiki with time left in the day, return to your hotel and enjoy the beach or the pool. You deserve a break. For your third day, you won’t even need to drive. The best way to travel will be on the island’s excellent bus service, appropriately called TheBus. For this middle day of your visit, explore historic downtown Honolulu. Be sure to see the 'Iolani Palace and the King Kamehameha Statue across the street. Walk through the State Capitol Building with its unique architecture as you head west to Chinatown. Honolulu’s historic Chinatown is a fun place to explore the markets with their unique fruits and vegetables and more seafood that you can imagine. It’s also the perfect spot to eat lunch at one of the fine Asian restaurants. You’ve had a busy first three days, so for day four, I recommend that you stay close to your hotel or resort in Waikiki. In the morning you can walk down to Kapiolani Park and visit the Waikiki Aquarium or the Honolulu Zoo. Both feature species unique to the Asia-Pacific region. Spend the afternoon at the beach or pool. Be sure to get some shopping done. Waikiki has some of the best shopping in Hawaii. You can also drive or take the bus to the nearby Ala Moana Center, the largest open-air mall in the world. For your last day on Oahu, I suggest you take a morning hike to the summit of Diamond Head. The hike to the top around the inside of the crater is best in the morning when the crater protects you from the hot rays of the sun. It’s a short 5-10 minute drive to Diamond Head and there’s ample parking available. After your hike, hop back in the car and make the drive to Oahu's Southeast Shore and Windward Coast. Spend a few minutes at Hanauma Bay, Sandy Beach and/or Waimanalo Beach Park. This is my favorite area of the island and one often missed by visitors. These are some of the most beautiful beaches in the world, so be sure to bring your camera. If time allows, continue north past the town of Kailua and head to Kualoa Ranch where they offer excellent tours including movie tours, ATV tours, horseback riding, garden tours and more. There is a lot to see and do on Oahu, so pace yourself. Don't tire yourself out on any given day. It’s OK to replace any one of these days with a “beach day” where you decide to just rest at the beach or pool. You'll be doing a lot of walking in Hawaii, so wear comfortable clothing and shoes. Many of the less known beaches are much prettier and less crowded than the famous ones.